A bear, a moose and a penguin ...oh my! This trio is ready to brave the chilly winter weather. This barnyard trio have nothing but smiles and welcome you to their sunflower covered home. Santa and friends are enjoying the bounty of Christmas sweet treats! 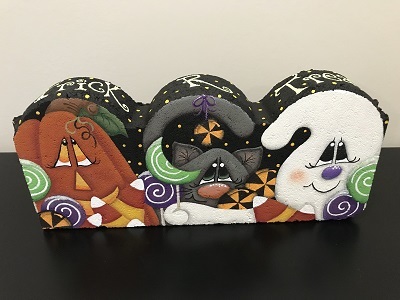 Trick or treat, give me something good to eat....candy corn and suckers, Halloween mints! 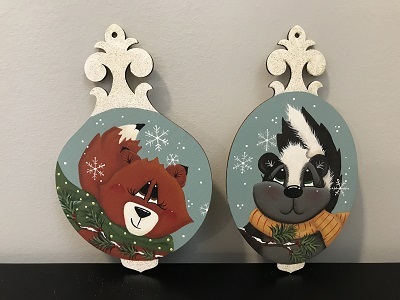 These cute critters are painted on flat wood ornaments from Bear With Us. 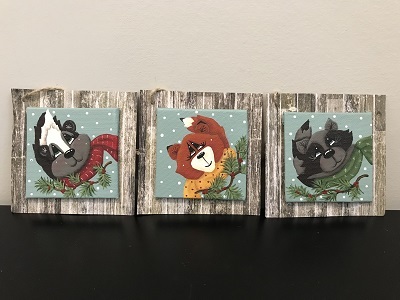 Painted on canvas squares, then attached to card stock...quick and easy ornaments. Previously published in Pixelated Palette, this guy always chooses adventure. Painted on canvas squares.